I has you, snake! I is hero! The trouble is that unlike Batman, Heracles began trying to have a family. He married a princess named Megara and they had at least two children. And then Hera made him go mad and he threw his children and maybe his wife into a fire. He would’ve gotten his best friend Iolaus too if Athena hadn’t knocked him out with a well thrown rock. Heracles solution to a lot of problems: hug it until it gives up. This is where Heracles got his iconic lion skin, which he wore to ask Eurystheus for another Labor. 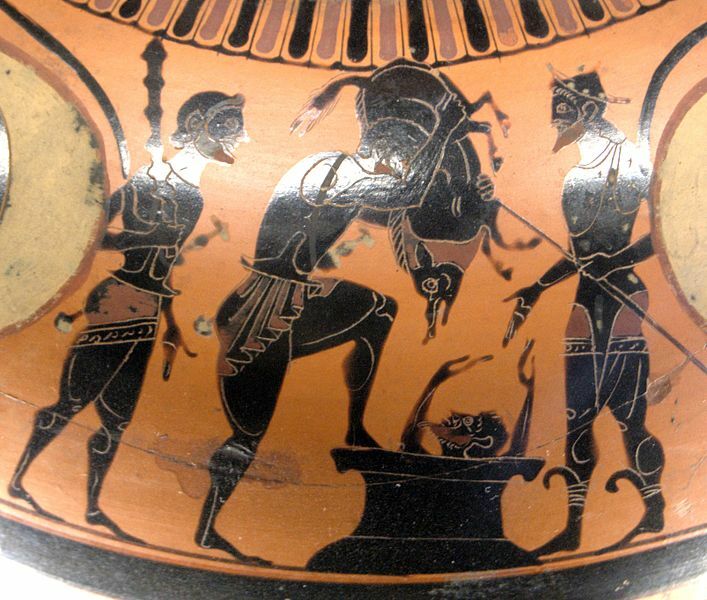 Eurystheus saw Heracles in all his grime, blood, and lion skin and decided he didn’t want to do this directly anymore, so he had a pot made that he could jump into any time Heracles showed up, and he had a messenger give him the Labors. This is definitely a two-man job. Iolaus required. So Eurystheus is beginning to realize that Heracles is good at not getting killed by monsters, so he decides to set him up to offend Artemis, who is good at smiting people who offend her. So Heracles is told to capture the Ceryneian Hind, a ridiculously fast deer that is sacred to Artemis. So Heracles chases this deer all over Greece for a year and then one day when he’s really tired, he wakes up and the deer is sleeping next to him. So Heracles gently subdues it and walks it back to Tiryns. First, there’s a side story to this one before we even begin talking about going Lord of the Flies on some boar. So, the Boar lives in the land of Arcadia, and Heracles’ friend Pholus the centaur lives there. So they’re hanging out and Heracles convinces him to open some wine. 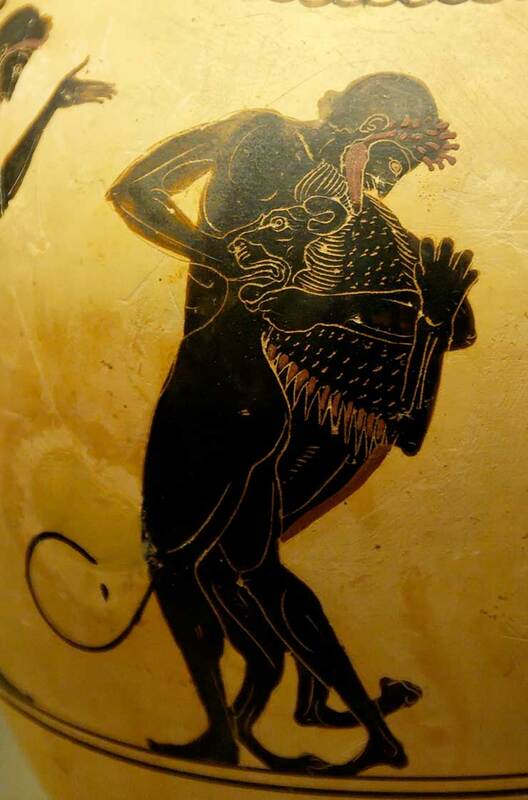 The trouble is that the only wine Pholus has is straight from Dionysus, so it’s like tear apart your son with your teeth strong, and Pholus’ centaur neighbors drink it and they get really, really messy and violent. 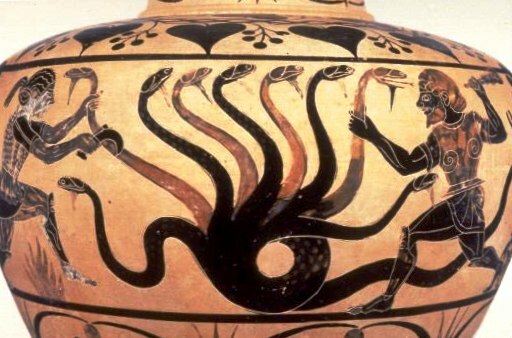 They attack Heracles and he kills them with his Hydra blood poisoned arrows. When the affair was over Pholus wondered why his friends were dead as a result of non-lethal arrow wounds, so he picked up one of Heracles’ arrows. He dropped it in surprise, and stepped on it, and he died. Chiron, the famous centaur trainer of heroes, also got hit by a stray arrow, but he couldn’t die, so he was just in agony all the time. Later, after Chiron could bear it no longer, he offered to take the place of the titan Prometheus who had given the mortals fire. That’s how much pain Chiron was in. Having your liver pecked out by an eagle every day while you were exposed on a rock was a better alternative. The gods let Chiron take Prometheus’ place and a few Labors later (probably after saving Alcestis) Heracles killed the Eagle that tortured his old friend, and freed him. In a lot of the legends, that was how he achieved his immortality. Okay, about boars: Capturing the boar was easy really. Again, Heracles just hugged it until it went limp and he carried it back to Eurystheus who couldn’t get into his pot fast enough. Back in the pot! Back in the pot! The Stymphalian birds were Ares, the war god’s pets. They were man-eating and could launch their metallic feathers like porcupine quills. Their poop was also poisonous. (You know some poor hero felt pretty lame in Elysium when people asked how we got there and he said “A bird pooped in my eye.”) The punchline to this is that they set up shop in Arcadia because a pack of wolves had chased them out of where they had been. A pack of wolves vs. birds with flying swords for feathers and poisonous dung. Right. Sure. So these birds just won’t move and Heracles is like “OH NO! WHAT DO I DO?! ?” And then Athena comes down all grey-eyed and serene, and she says “I’m having Hephastus make you some clappers right now. Chill. Avoid the poop.” And she brings Hephastus’ clappers to him and he claps the great bronze curves together and all the birds take to flight. Its like shooting birds in a barrel! 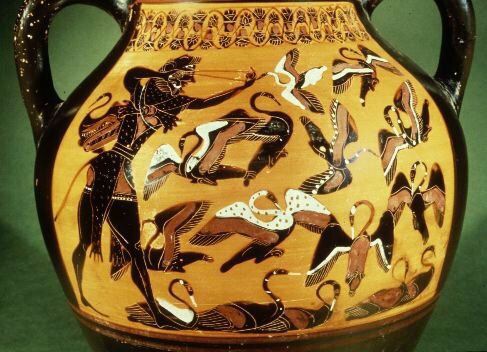 So Heracles goes all duck hunter and is just firing his Hydra blood dipped arrows at these birds and they all die or just fly away never to return. Diomedes had driven his horses mad by feeding them human flesh, and somehow they also developed the ability to breathe fire. In Alcestis, Heracles seems to know about the fire breathing but not the man-eating, so that gets you up to date. 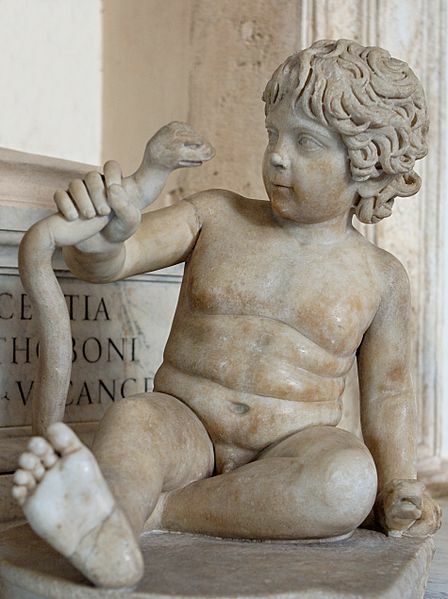 Mostly, think of Heracles as a mythical Ghostbuster, a slayer of chthonic monsters (i.e. monsters “from the depths” or originating from the Underworld.) But he’s also kind of tragic too, because he doesn’t fit in anywhere and trouble follows him everywhere he goes. In The Odyssey, when Odysseus goes down to the Underworld, he sees Heracles among the dead in Elysium, even though there are myths also say that Heracles became a god after his death. This is typical of the Heracles myth. He is every Greek, so he belongs to all of them. He appears in many legends and sometimes the timelines don’t add up. But he always stands for the best intentions, no matter what the outcome. Heracles is hope.